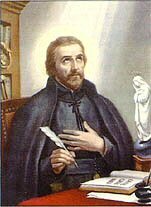 Meditations and ideas for St. Peter Canisius. As Christmas is in only 4 days, this is the time when we forget the spiritual focus of Christ's birth and worry about the externals—last minute shopping, baking, decorating, cleaning, etc. Remember to keep God in focus, and take St. Peter's quote to heart. If we trust in God and have the right priorities, we will find time to do it all. St. Peter did so much in preserving our Catholic faith against the Protestant Revolt, particularly in Germany against Martin Luther and his attacks on the Eucharist. There continues to be many attacks on our Faith from all sides, within and outside the Church. We should pray for St. Peter's intercession to help us grow in knowledge of our Catholic Faith, so that we can be witnesses and spread the Truth of the Gospel wherever we are. We should also spend much time learning more about the Faith, and building our spiritual life. Even if we only had 15 minutes a day of spiritual reading, it would be very efficacious! Let us, during this season of making resolutions, for it is the New Year in the Liturgical Calendar, ask St. Peter to guide us and help us build our Faith, so that we may know, love and serve God in this world, so as to be with Him forever in Heaven.